Only in sub-Saharan Africa is the risk for newborn babies as high as it is in South Asia.2 With one in every 35 babies born in South Asia dying within their first month of life, a child in South Asia is nine times more likely to die in the first month than a child in a high-income country, and twice as likely to die as a baby in the Middle East and North Africa (despite all the conflict there). In addition to newborn deaths, an estimated 1 million babies are stillborn - born without signs of life - in South Asia every year. Reduce newborn deaths from 28 per 1,000 live births in 2016 to 21 per 1,000 live births by 2021. This will save an estimated 500,000 newborns. By 2030, end preventable deaths of newborns, with all countries aiming to reduce newborn mortality to no more than 12 per 1,000 live births. Eliminating newborn deaths is a priority for UNICEF South Asia, because the majority of the region's newborn deaths are preventable. In close collaboration with governments and domestic and international partners, UNICEF teams support the development of national newborn mortality reduction strategies that are constantly monitored and improved. 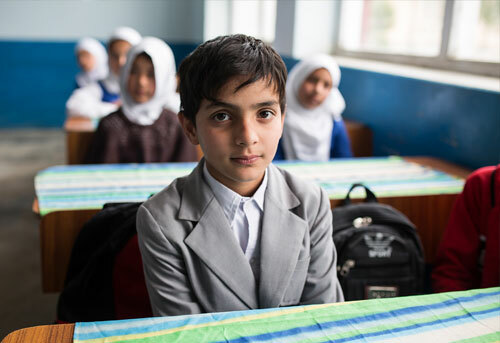 The teams and their counterparts feel a strong sense of urgency, aware that meeting the global and UNICEF targets will require more rapid progress, especially in high-burden countries such as Pakistan, Afghanistan and India. Access to skilled birth attendants, and delivery in facilities equipped for emergency obstetric and newborn care are core requirements for pregnant women. Many countries in South Asia have recognized the need to train more midwives, as the availability of skilled birth attendants - day and night - is crucial to scaling up proven, inexpensive interventions. For instance, starting breastfeeding early, applying chlorhexidine to the umbilical cord to prevent infection, using Kangaroo Mother Care, and detecting and treating possible severe bacterial infections in newborns all depend on the presence of skilled birth attendants. Other essential requirements are strong systems for training and coaching healthcare workers, efficient procurement systems to ensure continuity of supplies, a functional referral system, and a monitoring system that allows for prompt corrective actions where needed. Increased access to quality maternal and newborn care, especially around labour, during birth and during the early postnatal period will be the main focus of UNICEF South Asia's work through to 2021. This will be supported by community and partner engagement to ensure that pregnant women are able to seek antenatal care early, are supported in birth preparedness and are advised of the urgent need to seek care if threats such as pre-term labour become a reality. When financial or cultural barriers are reduced, women are more likely to seek skilled help during delivery. This gives quadruple returns: saving newborn and mothers' lives, reducing stillbirth, reducing the risk of disability in mothers and newborns, and improving child development. Better access to essential obstetric and newborn care will also reduce the number of families that experience the tragedy of losing a new baby. Most newborn deaths are caused by three preventable and treatable issues: complications related to prematurity; birth complications including lack of oxygen (asphyxia); and newborn infections such as sepsis and pneumonia.5 Many lives could be saved each year by investing in quality care around the time of birth, coupled with special care for sick and small newborns. The number of babies who are stillborn is also far too high. Globally the number of stillbirths is almost equivalent to the number of newborn deaths and the tragedy is that nearly 50 per cent of stillborn babies were alive at the start of labour.6 These are lives that could be saved with improved access to skilled birth attendants and better intrapartum care. Stillbirths are typically not counted by public health systems or policymakers as deaths, but each loss leaves an indelible imprint on the hearts of parents and families, and places psychosocial burdens and economic costs on families and nations. Many of the interventions that prevent newborn deaths can also prevent stillbirth. UNICEF and its partners must ensure that every stillborn is counted in national health information management systems so that interventions are evidence-based. The Sustainable Development Goals (SDGs) have set ambitious targets for all countries, including ending all preventable maternal and newborn deaths. UNICEF ROSA has therefore set a headline result target of reducing newborn deaths from 28 per 1,000 live births in 2016 to 21 per 1,000 live births by 2021. While progress has been made, the rate of decline must be substantially accelerated, especially in high-burden countries, if South Asia is to reach the SDG targets for newborn mortality. Although the region has made tremendous efforts to reduce maternal mortality, newborn mortality and stillbirths, faster progress is needed if South Asian countries are to achieve the SDG targets. Progress in reducing newborn mortality will need to more than quadruple in Afghanistan and Pakistan, and progress in reducing stillbirth will need to double in Afghanistan and India, and quadruple in Pakistan if the targets are to be met. Despite considerable progress, the coverage of essential life-saving interventions is inadequate in some countries. In Pakistan, key interventions during pregnancy, labour and after birth are not widely available. Only 37 per cent of pregnant women receive the recommended four antenatal visits and only 52 per cent of women in labour have the assistance of skilled birth attendants. Mothers are discharged too soon and only 43 per cent of newborns receive care within two days of delivery (despite the fact that 70 per cent of newborn deaths occur within the first 24 hours after birth). Other shortcomings are seen the poor quality of perinatal and early postnatal care, including insufficient early initiation of breastfeeding (18 per cent), and too little exclusive breastfeeding (38 per cent). Better coverage of essential maternal and newborn health services will translate into better health outcomes as death and disability are prevented. A woman is more likely to have access to a skilled birth attendant if she lives in a town rather than a rural area, particularly in Afghanistan, Bangladesh and Pakistan. And richer women are far more likely than poor women to have access to a skilled birth attendant, especially in Bangladesh, Afghanistan, Pakistan, Bhutan and Nepal. This calls for maternal and newborn health programmes to be planned based on sound analysis of the barriers to equitable access to life-saving services. Policy and legal frameworks, governance, financial investment, human resources, supply chain management and other core health-system building blocks need to be continuously managed and monitored to ensure that service are available to pregnant women at all times. For instance, although maternal and newborn death rates are higher among adolescent girls, only two countries in South Asia (Bhutan and Sri Lanka) have legislation that allows adolescents to access family planning without spousal or parental consent. Although most countries have costed national plans for maternal and newborn health and have introduced maternal death notification and reviews, there are important health financing and human-resource issues that need urgent responses from all South Asian countries. Government expenditure on health is still short of the Abuja Declaration target (at least 15 per cent of total government expenditure) in all South Asian countries except Afghanistan and Maldives.11 With the exception of Maldives and Bhutan, over 40 per cent of health sector financing comes from direct payments made by individuals to healthcare providers at the point of use. The poorest families therefore underutilize lifesaving care (such as antenatal care, delivery by skilled birth attendants and postnatal care). This in turn increases the burden of newborn and maternal deaths among these families, and the issue needs to be addressed by health programming informed by evidence of marginalization. Low government investment adversely affects the availability and retention of human resources for maternal and newborn healthcare. The World Health Organization (WHO) recommends that there should be at least 23 skilled health personnel per 10,000 population. For some countries in South Asia, the figure is far less: 7 per 10,000 in Afghanistan and Nepal, 6 in Bangladesh, 13 in Bhutan and 14 in Pakistan. There is also increasing evidence that the region's rapid urbanization and the fast growth of urban poor communities have put strains on health services. These urban communities have limited access to private healthcare and the local public-sector services have not been boosted to meet the needs of a fast-growing population with higher burden of diseases. 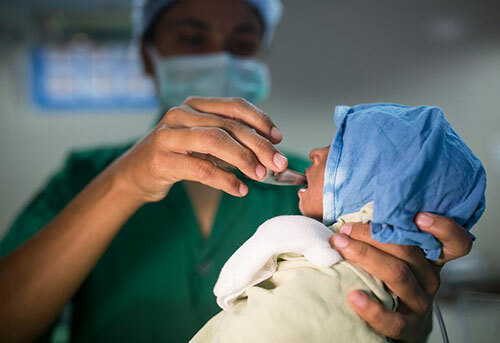 A 2014 analysis of newborn interventions in India, Pakistan, Bangladesh, Afghanistan and Nepal revealed a range of bottlenecks in the various health systems. They included the absence of skilled human resources, poor service-delivery, insufficient financial resources, and poor community ownership and participation (see Table below). 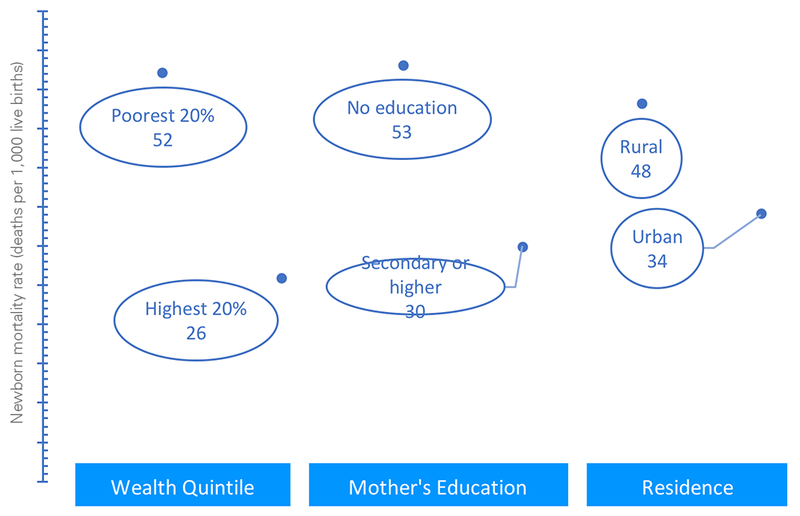 Underlying factors included ineffective or absent accountability mechanisms and poor governance, together with social determinants of health such as low education of mothers, poverty and child marriage. UNICEF South Asia has set a regional target of no more than 21 deaths per 1,000 live births by 2021 and saving additional 500,000 newborn babies between 2017 and 2021. We are working with all UNICEF country offices to accelerate progress by supporting the development and implementation of costed national newborn action plans and by supporting the development of quality improvement guidelines for maternal and neonatal health. Maternal and perinatal death surveillance and response (MPDSR) mechanisms were introduced in five countries, and workshops and webinars on essential newborn care and the care of sick newborns boosted capacity and quality across the region. In 2017, UNICEF South Asia hosted a global workshop on maternal and newborn metrics - examining how health management information systems can improve data collection and make them more relevant for decision-making and accountability. As a result of these sustained efforts with its partners, UNICEF South Asia surpassed its target of saving 300,000 additional newborn lives over the 2014-2017 period: figures from the UN Inter-Agency Group for Child Mortality Estimation indicate that an additional 372,886 newborn lives were saved in South Asia between 2014 and 2017. A key target in support of this goal was to increase the percentage of live births attended by skilled health personnel to at least 80 per cent in two countries (Maldives and Sri Lanka). This was exceeded: by 2017, four countries had achieved this - Bhutan, India, Maldives and Sri Lanka. Top priority for 2018 is to strengthen the capacity of the national referral hospitals that serve as national 'point of care quality improvement' (POCQI) centres. The aim is to create a viable platform for scaling up quality care for small and sick newborns, with the participation of national teaching institutions and professional associations for obstetrics and pediatric care. A regional training of trainers in Kangaroo Mother Care (KMC) was completed in June: national trainers were trained for Afghanistan, Bangladesh, Bhutan, Nepal, Maldives and Sri Lanka where implementation plans for national scale-up of quality improvement were developed. UNICEF, together with the H6 Partners, will also assist governments in updating their national Every Newborn Actions Plans to take into account the renewed call to end preventable stillbirths and maternal deaths. As part of the regional quality improvement efforts, UNICEF South Asia, with the Bill and Melinda Gates Foundation, is helping to provide coaching and mentoring technical support; we are also providing South-South learning opportunities for the delivery of quality care that meets international standards. 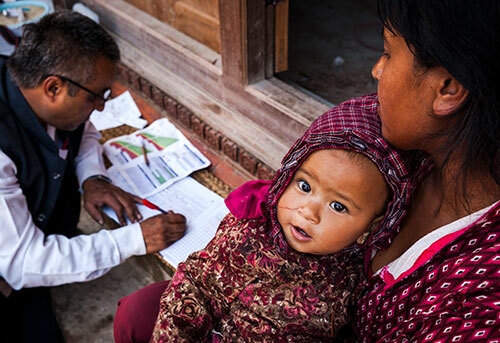 UNICEF South Asia will redouble its efforts to support evidence-based planning and budgeting to accelerate efforts to end preventable maternal and newborn mortality and stillbirths. We need to redouble efforts to reach mothers who are in the lowest wealth quintiles, those who are uneducated and those in rural and remote areas where skilled birth attendants are too few. Planning must take into account the currently under-assessed needs of women and newborns in the rapidly growing peri-urban poor communities where public sector services are unable to keep up with demand and where poor women are unable to afford access to private obstetric and newborn care. To advance the regional objectives to end preventable maternal and newborn mortality and to reduce stillbirths, UNICEF works alongside its H6 partners (WHO, UNFPA, UNAIDS, UN Women, World Bank) and in close collaboration with regional organizations such as SAARC, donors such as USAID and international NGOs such as Save the Children. 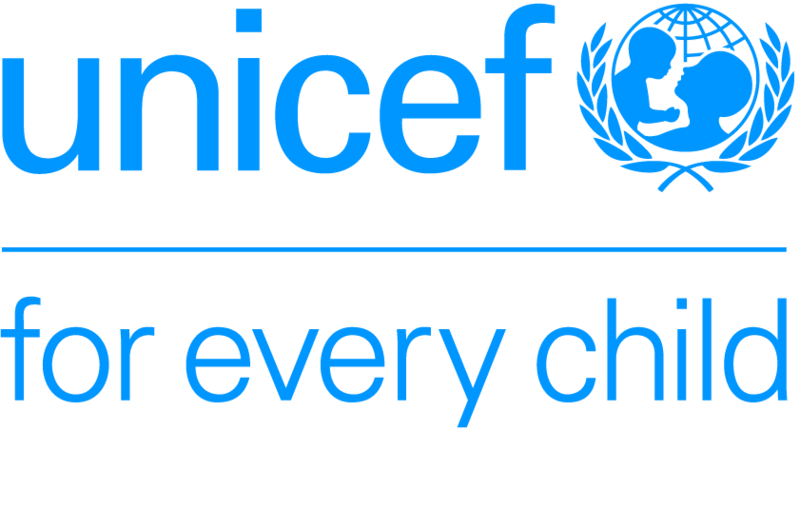 UNICEF is also looking to increase its work in national and regional partnerships with public and private sector entities, including regional professional associations. UNICEF South Asia has been monitoring progress of the Every Newborn Action Plan (ENAP) in the region, particularly to assess achievements towards national milestones. With the full support of government and development partners, all country offices were tracked. The results have been incorporated into a global newborn report. Areas requiring further attention include the addition of specific newborn health-related indicators to health management information systems, and better quality maternal and newborn healthcare (including scaled-up perinatal death surveillance and response). 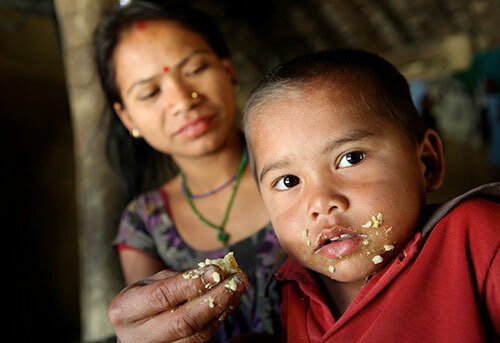 UNICEF has been supporting governments in South Asia on the care of sick newborns for decades. Country offices in Afghanistan, Bangladesh, India and Pakistan have reviewed (or are reviewing) this type of care. The results will be very used for strategic planning. UNICEF South Asia is supporting country offices to conduct newborn research based on each country's situation. Topics include Bangladesh's implementation research on enablers and barriers for Kangaroo Mother Care implementation, and health-seeking behaviours for female newborns. Preterm births and extremely low birth-weight were the leading causes of newborn death in the Kurigram District Hospital special baby-care unit in Bangladesh. Evidence shows that appropriate care of such infants, including temperature monitoring, can substantially reduce mortality. 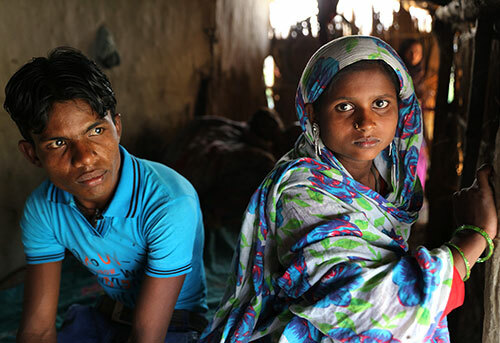 Bangladesh's Ministry of Health and Family Welfare (MOHFW) and UNICEF, with funding support from the Bill and Melinda Gates Foundation, are setting up special facilities to improve healthcare for mothers and their newborn babies in Kurigram District. They are also tackling (through cyclical quality improvement) life-saving interventions such as improved routine monitoring the body temperature of small and sick newborns and improved use of temperature charts for the special baby-care unit of the hospital. With technical support from the health ministry and UNICEF, hospital teams created quality improvement teams who define priorities for their hospital. These Plan, Do, Study, Act (PDSA) cycles test a selected intervention on a small scale and assess its impact as part of action-learning projects that get teams to coalesce and become problem solvers. Teams define how their selected interventions will be implemented, monitored and reported. They then review the results make timely adjustments and document processes and lessons learned for replication and scale-up. One such example is the Kurigram District Hospital team's decision to monitor the temperature of all low birth-weight babies. They used two indicators to measure progress: the proportion of low birth-weight babies whose temperature was measured using a temperature chart and the number of babies identified as having hypothermia. After the first week, 6 of the 12 low birth-weight babies were measured and three were found to have hypothermia. The quality improvement team then assigned a designated nurse to ensure that every shift had sufficient temperature charts. After three weeks, the temperature of all low birth-weight babies was being monitored. Temperature measurement practices are now included in the special unit's standard operational procedures. The quality team achieved its aim of improving temperature monitoring for low birth-weight babies from zero to 100 per cent in four weeks. The special care newborn unit has sustained these results: over 19 weeks, they identified 140 babies with hypothermia among 180 admissions of low birth-weight babies and managed them properly. The team has now decided to take new initiatives such as differentiating babies born inside and outside the hospital in terms of the whether they develop hypothermia.